U.S. Senate candidates Larry LaRocco, a Democrat, and independent Rex Rammell will hold their second live debate tonight (Wednesday, September 10). This one is in Sandpoint, and North Idahoans who want to catch it in person can do so from 5 to 6 p.m. Pacific Time in the Sandpoint Center Community Room, 414 Church St. The rest of us can catch it live on the 'net. We'll have the feed here at Red State Rebels at 6 p.m. Mountain/5 p.m. Pacific, or you can view it at the LaRocco for Senate website (where you can also submit a question in advance). Republican candidate Jim Risch has been invited to take part, but he did not respond. U.S. Senate candidates Larry LaRocco, a Democrat, and Rex Rammell, an independent, will meet in the first of 10 planned debates tonight (Monday, August 18). The live event is at 6:30 p.m. Pacific Time in the Riverstone Room at the Hampton Inn & Suites, 1500 Riverstone Drive in Coeur d'Alene, but people statewide can catch the event live on LaRocco's website starting at 7:30 p.m. Mountain/6:30 Pacific. Questions for the debaters are also being taken in advance of the event here. This is an interesting gambit for LaRocco, whose poll numbers are rising, and for Rammell, who is one of the stronger third-party candidates Idaho has seen. There will be sharp differences between them on most issues, and both are likely to win more support from independents and undecided voters than will Jim Risch, who will dodge these debates (and the Idaho Public TV-Idaho Press Club-League of Women Voters event this fall). If LaRocco and Rammell can keep Risch's support well under 50 percent, LaRocco will have a chance to prevail in the election on November 4. Update 5:50 p.m. We'll have the live stream and chat capability here at RSR as well. Update Tuesday morning: The recorded video of the debate is available here. Bill Sali is in a heap o' trouble over his vote to deny continued timber program payments to rural communities hurt by logging cutbacks - money that helps fund schools, roads, police protection, and more across 700 rural counties in 39 states. To be fair, almost all the House Republicans - including Mike Simpson - voted against the bill because they didn't like Democratic plans to pay for the extension by collecting back payments from big oil companies. But Sali is taking more heat than most because he represents a district that will be one of the hardest hit by the decision. As the Walt Minnick campaign noted yesterday, losing these funds could mean a $2.8 million budget shortfall for Idaho County, while Shoshone County stands to lose $4 million - a full third of its annual budget. So far, the Sali for Congress campaign has accepted $21,000 from oil PACs and $371,366 from all PACs, which is 75% of his contributions. The Minnick for Congress campaign has accepted no oil PAC money, and $29,500 from all PACs, which is 4% of his contributions. You can ask the question, If top priority was getting a funding bill passed, why would (Oregon Rep. Peter) De Fazio and his allies run one that was so likely to draw Republican fire and therefore likely doom it? (Of course, finding the money hasn’t been an easy thing regardless - (Oregon Rep. Greg) Walden and other Republicans haven’t yet found a winning formula either.) But we suspect that will be superseded by another question: When the choice came to a decision between taxes paid by oil companies and desperately needy counties in the Northwest, why did those Northwest representatives vote on the side of the oil companies? That could be a deadly question. I certainly support local control and local option authority, but this bill is a complete sham. This is going to centralize control in Boise more than ever, and ensure that local folks can't get a fair say in how we determine our futures locally I sure hope the Idaho Senate kills this wrong-headed election-year bill. This bill is about GOP primary politics in southern Idaho, not good government. If this idea is so good, why don't we put a constitutional amendment on the ballot that every single special interest sales tax exemption passed by this legislature should be put to a vote of the people and has to be passed by a 66 2/3 majority? There is no difference. I hope our North Idaho legislators don't get duped by this southern Idaho power-play bill. Let's just be clear that "southern Idaho" doesn't mean Boise but the GOP power players from Star, Donnelly, and Oakley. But if some Boise bashing is what it takes to kill this sucker, I'm fine with that. On March 2, 2008 Senator Jon Tester of Montana spoke at reception in Coeur d’Alene honoring former Congressman Larry LaRocco. 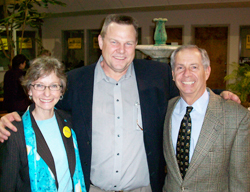 Tester gave a rousing endorsement speech about his experiences during his ’06 U.S. Senate race in Montana when he defeated incumbent Republican Senator Conrad Burns. He spoke of the political climate there during his campaign and how closely it resembles what is occurring here in Idaho during which Tester proclaimed, “Larry will win the open seat in Idaho.” Working Idahoans are upset with the status quo. The current Administration has failed to address the real issues that matter to real people. The same forces that sent Tester to DC to help working families in Montana are identical to those forming in the majestic Gem State. Tester believes Larry has the experience, knowledge, and leadership skills necessary to become Idaho’s next U.S. Senator. Tester looks forward to the day he can address Larry as a colleague so they can roll up their sleeves together and get to work on the hard issues that matter most to those on both sides of the Rocky Mountains.